Labuan Bajo is a small fishing town located at the western end of Flores, in the Nusa Tenggara region of East Indonesia and gateway to the Komodo National Park. 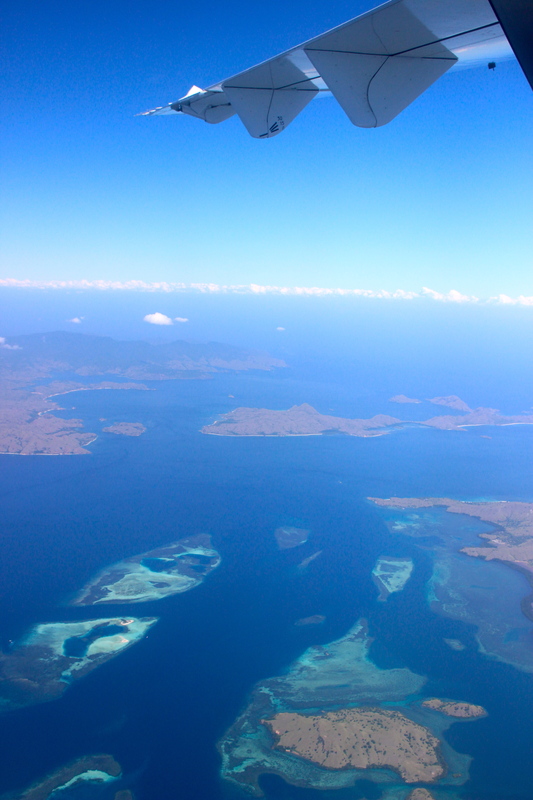 This little port town is the launching point for trips to Komodo Island and Rinca Island, home to famous komodo dragons. Diving, snorkeling and islands hopping in the Komodo National Park are also famous activities for tourists who visit this island. My children and I only spent three days in Labuan Bajo, which was very short I know. So, as expected we didn’t see as much as we would like. But, not to worry, we are planning to come back there again on a road trip from Lombok, one day, fingers cross! While the father of my children and his two brothers spent four nights on a dive boat, my boys and I had a fun-tastic four days in Bali surfing, water-booming, and eating yummy food before we flew to meet the rest of the crew. If you fancy a bit more posh type accommodation, try Pelataran Komodo, is a bit out of Labuan Bajo and of course way dearer. Since basically we only have two full days in Labuan Bajo, the next day we rented a wooden medium size local boat and off to Rinca Island to see the dragons. 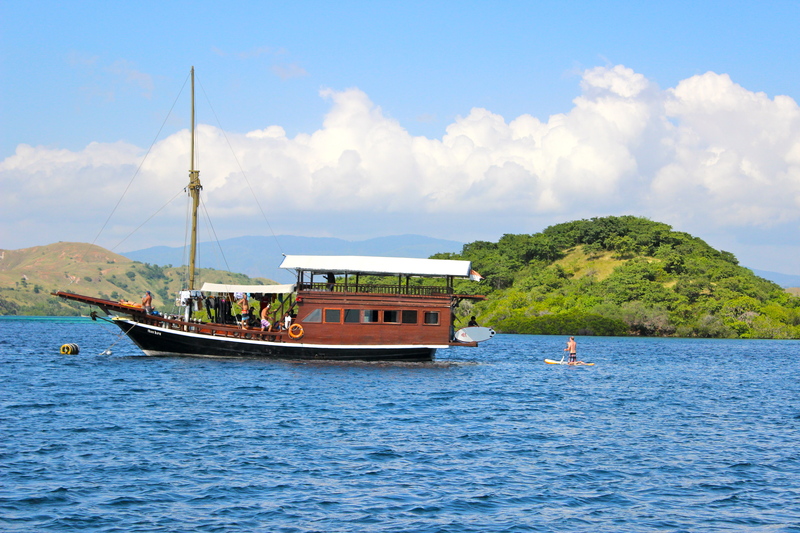 Rinca is slightly smaller than Komodo Island and easily done in a day trip. From Labuan Bajo to Rinca Island it took us about 2 hours, as it was a slow boat as well, but that was ok as it was beautiful scenery and calm clear sea. We stopped to pick up my brother-in-laws who were still on the dive boat somewhere near Rinca Island. The komodo dragon only can be found in Komodo Island, Rinca Island, and Gili Matong. It is not very easy to find the dragon in the bush, but our tour guide knows the spots where the dragons sun-bathing, it’s near the camp kitchen 🙂 He also showed us where the females dig huge burrows to lay their eggs. I think I had high expectation of this lizard thing. I thought they would be so big in size and so many. In fact, they were not that big and only a few around. According to our guide, komodo dragons can smell blood within 5 kilometers, so women who are having period are advised not to visit the island. In case you are chased by the dragon, you should run zig-zag or try to climb a tree, as they can only run straight and can’t climb trees…. at least that’s what our boys had read somewhere. can you spot the dragon!? After Rinca, on our way back to Labuan Bajo, we detoured for snorkeling around the Mawan Island hoping to see some Manta Rays. The wind had sprung up and the trip was a bit windy, rough and wet with spray. To our disappointment there were none, maybe because the current was so strong and seas rough at that time. So we moved to another protected spot, and oh my God lots and lots of colorful fish swimming around like crazy with bright, colorful corals surrounding you. Very beautiful! The next day we hired a car with a driver and headed to Wulang waterfall. From Labuan Bajo is about 30 km, not that far, but we went through a long winding, bumpy, dodgy and very steep up and down hills road. Even the bridge had partly collapsed in some places. We stopped at the post entrance to pay for the fee and from here we had to walk for about 1.5 hours to reach the waterfall and gorge. Our guide, Pak Thomas Munro, who is an old man and the head of the tribe of the village, walked very fast and easy while we were trotting and puffing behind him. It was not that bad going down, but on our way back it was going up all the time. I almost felt like this was never gonna end and I just wanted to lie there and could not move. I was drenched in sweat that my t-shirt just wet. It was no problem at all for the boys though…..they were just as quick as a deer hopped here and there! I think I need more “boot camp” session! The waterfall itself is pretty amazing. Unfortunately by the time we got there a few local people and tourist were already there, so I felt a bit ‘uneasy’ but it was not that bad. Of course my kids had to jump off the cliffs a couple of times. I only did it once and that was enough for me! We swam and it felt so good, so refreshing. I highly recommended this restaurant. The food is delicious and the service is good and quick. From where you sit, especially if you are on the second floor you can see the harbor of Labuan Bajo. We ate here twice and ordered the same things ; grilled fish, squids balado, long beans with chilli fish, kangkung balacan, and grilled prawns…ohhh so yummy! 🙂 Food is cheap in Labuan Bajo, by the way. From Bali, there are couple flights in a day operated by Garuda and Lion Air. It’s 1.5 hour flight and very pleasant. 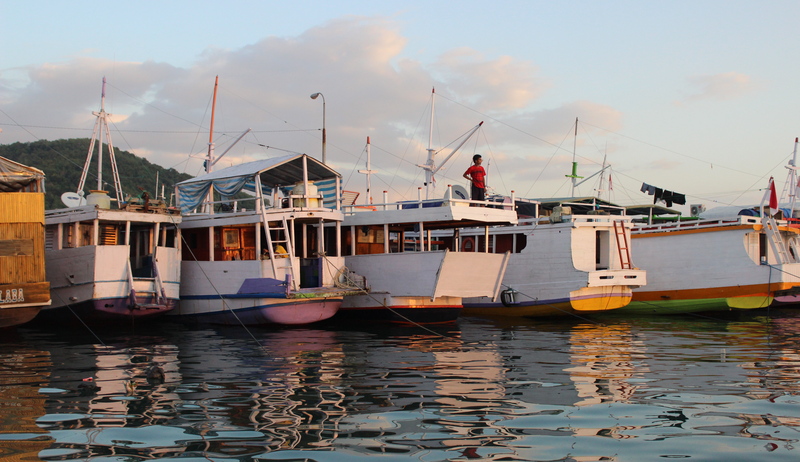 From Lombok, there are boats and ferry too. Iya Man, viewnya masih pure cakep, airnya masih biru jernih dan ga ada sampah. Indonesia has lotsa beautiful place as long as they know how to look after it. Dan semoga si Flores ini ga berubah jadi kayak Bali ya! What a lovely trip u had!! Hahaha iya Feb, aku amazed sama foodnya. Kirain gitu di Labuan Bajo makanan bule ya biasa aza standardnya, glad itu orang2 Aussie pada happy dengan mral ya😀 Tapiii…cerita mo ke toiletnya itu ‘lucu’ dan ‘aneh’ deh. Kamu waktu ksana siang ato malem, ke toiletnya ga? Huahhhahah parahhh bgt!!!!! Itu kamar tidur guesthouse nya dia ya mbak? Hahaha gak jelas bgt ya ampun…. Kalo ada kesemoatan kudu ke Flores Jo, viewnya masih pure cakep. aiiih serunya acara liburan keluarga ke labuan bajo, view dari hotelnya itu loh baguuuus banget…. Iya Adhya, view dari hotelnya bagus apalagi pas sunset. You must go there Ta. It’s very beautiful and still un-touched unlike Bali. Very exciting place in one completed journal. Terkesan pengen kesana lagi deh, dulu pernah cuma sekali tapi cuma ke komodo, soalnya gowes sih dari jawa. Liburan kuliah kurang lama untuk mencicipi semua surga di Flores and surrounding islands.